Of the two major Warner Bros projects this year that Ben Affleck has been involved in, The Accountant is by far more solid than the one where he plays Batman. But that doesn’t necessarily mean that this one is completely perfect either, and like the on-the-spectrum main character that he plays, the film is functioning but not entirely clear-headed either. Affleck plays Christian Wolff, a man with high-functioning autism who works as an accountant at a small, shady firm in the suburbs of Illinois. However, unbeknownst to the rest of the world, he makes far more of a living by uncooking the books of dangerous criminal organisations that are experiencing internal embezzlement (I had to borrow this sentence from Wikipedia, because it was honestly hard for me to keep track of what exactly he was doing; but more on that problem shortly). When he is called in to sort out the backlog of a high-tech prosthetics company, he finds that quite a lot of money has gone missing, and when he and fellow accountant Dana (Anna Kendrick) are suddenly being targeted for assassination, he finds out that someone high-up in the company wants this problem to be contained. Using the extreme training he received as a child from his stern military father, Wolff soon springs into action, whilst also trying to shake off his tail not only a mysterious assassin (Jon Bernthal) but also the US Treasury Department led by J.K. Simmons’ determined agent. As someone with high-functioning autism myself, I was very impressed with how they handled subtle mannerisms that Affleck’s character expresses, from small freak-outs about not being able to complete a task, to a structured and carefully preserved lifestyle (though mine isn’t perhaps as OCD as Affleck in this movie, who feels he must not have any of his food touching and only having one knife, fork and spoon set in his kitchen drawer). Affleck himself is really effective in this, displaying a quiet and unusually calm awareness of the world around him while also lacking the proper social skills to truly fit in, something that he later makes up for by switching to full-on action mode when the script requires him to. He shares a cute chemistry with co-star Kendrick, though given she’s at least a decade younger than him it was admittedly a little distracting when they were sharing scenes where they’re meant to be bonding (a bond that is never consummated, thank goodness). He also shows a large amount of strength in the action scenes, showing he came off of Batman v Superman: Dawn of Justice with some idea of how to take people out in the most awesome way. Though Affleck undoubtedly carries the film, he still can’t save other chunks of the film from a fateful amount of exposition dumps, and a story which when added up really doesn’t make a whole lot of sense. The entire sub-plot with Simmons trying to find Affleck’s character, including blackmailing a younger agent into finding him with shady records of her own criminal past, doesn’t play into the main narrative at all, and is just there to simply provide heaps upon heaps of exposition about who Christian Wolff is, and his mysterious past. You could seriously cut out that entire sub-plot and the film would not be any different, in fact it might be even tighter and certainly a bit shorter, especially as some scenes in that part of the film seem to go on for what feels like an eternity, and without some kind of satisfying payoff. Story-wise, it relies heavily on convenience and far-fetched nonsense to keep things going. The moment that Bernthal’s character appears on the screen, you know almost instantly where things are going to lead for him, and you have to wonder how much the universe is aligning to bring both his and Affleck’s characters together because of it. On top of that, throughout the film Affleck is in contact with a mysterious woman over the phone, who is also seemingly giving valuable information to the government (?! ), and who upon revealing who it is at the very end makes that even more confusing as to how that exactly works. 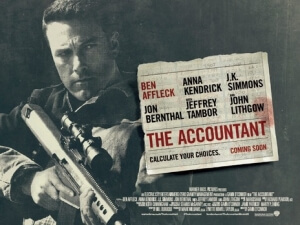 Despite the obvious flaws in Bill Dubuque’s script, director Gavin O’Connor still makes The Accountant a decently-made thriller to watch (even if he can’t fix some of the pacing issues from the screenplay), with a solid lead Ben Affleck performance to keep it fairly straight-lined. Much like the interior thought process of Christian Wolff, it’s a bit muddled, but you can’t help but admire its potential. The Accountant features a solid lead performance by Ben Affleck, but there are some gaping holes of nonsense and exposition to mind out for if you are to get full enjoyment out of this picture.